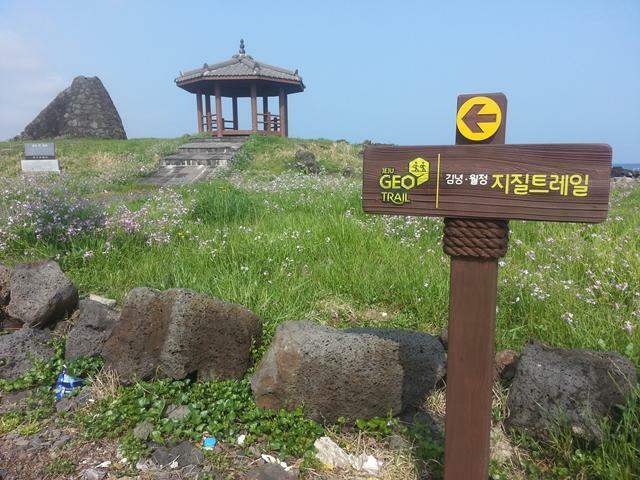 Jeju received Global Geopark status in 2010 and it now has 12 sites from Udo in the east to Suwolbong Peak in the west. There are also three Geo Trails, the first of which opened at Suwolbong in 2011, while Sanbangsan-Yeongmeori followed in April 2014. Gimnyeong-Woljeong is the most recent addition, being added in October last year. Not intended as merely walking routes, they are conduits for the preservation of local cultures enriched by geological heritage. To be successful, therefore, they must be more entwined with local history and culture, engaging walkers with the local stories that give meaning to the landscape. This contrasts them somewhat with Jeju Olle, which is much more focused on ‘healing’ and imbibing the landscape for its own sake. 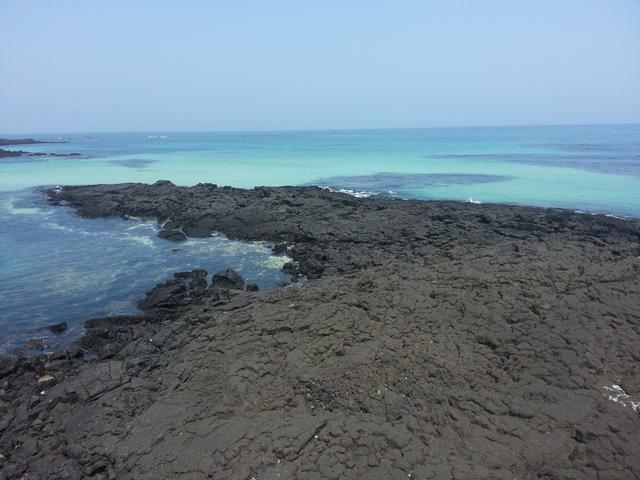 The essence of Global Geoparks is thus a bottom-up approach to “living with mass tourism,” said Ibrahim Komoo, coordinator of the Asia Pacific Geopark Network (APGN), to The Weekly in 2013, adding that Jeju still had some way to go in this respect. Efforts have clearly been made in this direction and the quality of the signage is probably the best of any tourist trail on the island — in Korean, English, Japanese and Chinese — meaning walkers are always aware of what they are looking at. I was impressed. 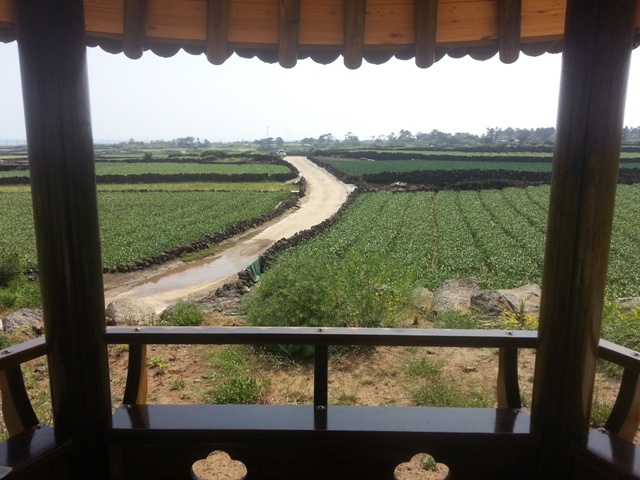 I actually felt I learned something about Jeju, rather than just going home with that ‘wow’ feeling of revitalization. Much like rich mineral deposits in geological strata, there are nuggets of knowledge all along the 14km route. It is split into two stages, both of which are nearly always above wending subterraneous lava tubes. The Durubille-gil (‘lava field path’) traverses 9km of hinterland farmland atop ancient lava deposits, and the Badangbille-gil (‘lava sea path’) follows the coast from Woljeong to Gimnyeong for 5km. Taking just 4 hours to complete, the circularity of the trail is a great advantage. Armed with a map and thickish guidebook — both in English and free at Gimnyeong Euollim Center — the experience was best when engaging the walker with local culture, facilitated well by the English resources. Compared to some of Jeju’s hillier locales most of this region is flat, explaining the presence of the “bille,” lava deposits, and the lava tubes underground. At times the path seems almost paved, yet the helpful signs explain the geological processes involved in its creation. There is just as much cultural as geological heritage to be enthused about. A personal favorite was visiting sites associated with the region’s rich shamanic heritage. The trail passes three shrines on the first leg around Gimnyeong, and then another in Woljeong. 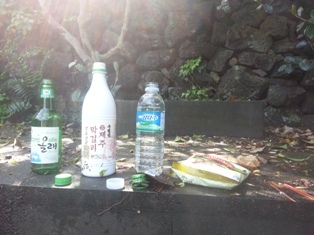 All were clearly regularly used with offerings — mostly soju bottles — freshly placed on the altars. 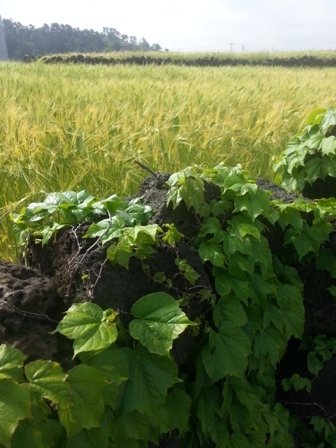 Much of the Durubille-gil follows the Billewat-gil, a walking path celebrating Jeju’s lava heritage. Whether it be the exposed lava flows, the gotjawal-like rocky soils, or the stone walls separating fields, the volcanic genesis of the island is always present. The absolute highlight was the section behind Woljeong-ri, where the stone walls, FAO Globally Important Agricultural Heritage Systems, are abundant. 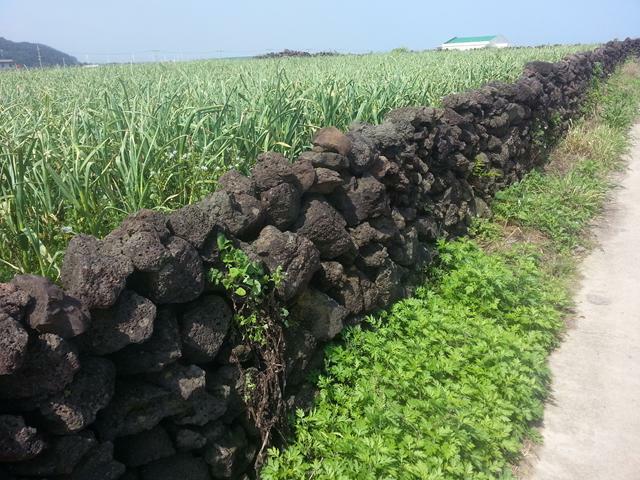 The rocky soils here allow for some appreciation of the difficulties Jeju people still have in cultivating the land, one of the reasons the women of the northeast are renowned as haenyeo (diving women), once a necessity to support families due to the poor harvests. After the solitude of the rural stroll, reaching Woljeong is like entering another world. The serenity of the interior is abruptly halted by coffee shops, snack bars and guesthouses. It is all quite quaint, but I was happy to forsake an over-priced latte and continue on. This is the start of the Badangbille-gil and it lives up to its name (badang meaning sea in the local dialect) by giving walkers a refreshing seaside stroll. 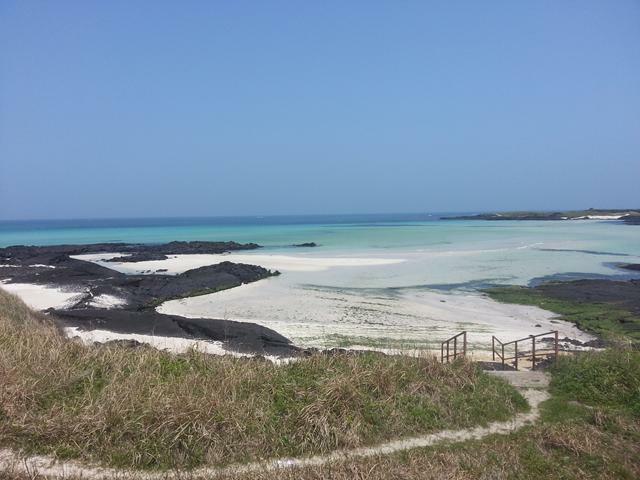 It passes two stunning beaches — Woljeong and Gimnyeong Sunsaegi — which boast among the whitest sands and cleanest waters on the island. Although the heritage sites are somewhat scarcer now, the sea breeze stimulates the mind and it is the perfect time to reflect on one of Jeju’s lesser-known, yet picturesque corners. 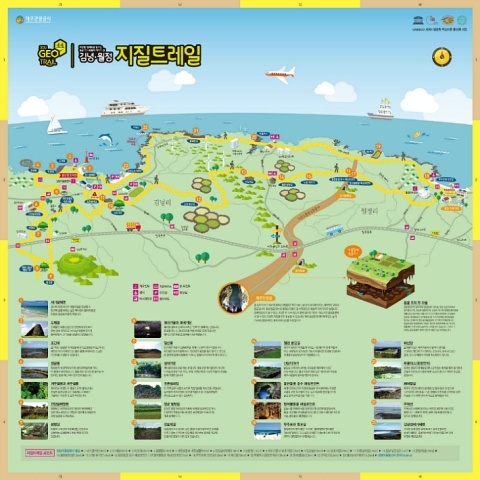 Call Jeju Geopark on: 064-740-6971.